Discussion in 'Defence Analysis' started by NS52, Feb 26, 2017. End of the day Vietnam stayed occupying Cambodia, Khmer rouge (Chinese ally) never returned to Cambodia and therefore China's objective failure is plain to see. So you being unable to defeat a much smaller country than Pakistan to the extent like we did in 1971 speaks volumes. Only can invade and occupy places like Tibet and Turkestan....but any well armed opposition and China fails badly...no wonder Japan did what they did to you in WW2. China's objective was to show Vietnam that they could not rely on the USSR to protect them; China perfectly achieved said objective. Vietnam was merely a pawn in the USSR's strategy and China made short work of them. Further, is it correct to say that China's humiliation of India means that India was, and (let's be honest, here) still is, a very weak country by your definition? Yes. Yes, it is indeed. I admire your guts that even after Nathu La incident you have to make such comments about Indian Army. Try another new game across LAC and see what happens to your third rate coward PLA, try it in Air or at high seas. Have you seen the SCS map and how you have been bottled up within SCS? Let me see one PLAN ship break out to Pacific or IOR. I challenge you. snehil aditya, Lion of Rajputana, zebra7 and 4 others like this. After seeing Baahubali, I'm dreaming of Bharat doing world conquest and restoring a Dharmic world. Golden_Rule, Wolfpack and vstol jockey like this. China's objective was to show Vietnam that they could not rely on the USSR to protect them; China perfectly achieved said objective. The main objective was to get the Vietnamese to leave Cambodia so the Khmer Rouge (Chinese ally) could crawl out of the jungle border areas and re-assume power in Cambodia. It never happened. A grandiose failure and you couldn't even reach Hanoi given the massive casualties the Vietnamese inflicted on you. USSR was there to prevent any strategic war, which it did simply by absorbing the stationing of Chinese forces overall esp after Sino-Soviet split. USSR knew Vietnam could handle such large scale tactical engagements on its own...and the Viets did not disappoint. They stayed on in Cambodia and left (10 years later) only when they ensured it was peaceable and on their own terms....and that Khmer Rouge was eradicated and could never return. Its good optically that China in all of this venerates and supports a mass murdering regime just like it has a mass murderer in a portrait that it venerates at Tiananmen Square (which is now associated with yet another mass murder incident). I'm still waiting for the Germans to put one up of Hitler at the Brandenburg Gate and the Russians of Stalin in the Kremlin.....to parallel with how China continues to represent itself and who is worthy of veneration.....to complete the trifecta of mass murderers (everyone largely agrees upon internationally) in the 20th century. Its called reading the sources beyond wikipedia. Of course a little kid like you probably doesn't know how to do that. Rematch was given in 1967 and you got spanked so badly you never returned, not even to prevent your best friend and ally from getting dismembered in 1971. Guess your bums were still sore and memories were long as to Cho La and Nathu La. Now tell me what rematches you had with Vietnam since 1979 to prove any other result? You just went even more into paper tiger mode. Lots of bark, no bite. Any time you want any place you want, let China test if India is "very weak"....of course the smarter non-keyboard warriors unlike you (who run the govt and military) would not want the answer....they genuinely fear countries several times smaller and weaker than India in the first place. Golden_Rule, Lion of Rajputana, A_poster and 3 others like this. With all of your tough talk, I sure hope your military has improved more than your economy. Seems you have not read how we cooked you in 1967 & 1987. This is 2017. remember the last number is 7. Not good for China. You got the best of a little skirmish during a time of widespread Chinese famine and poverty in 1967, great job. In 1987, there was no war so I am not sure what you mean. China was pretty upset with Indian provocations, but then you sent your diplomats to smooth things out. China is a very reasonable country and will always prefer peace over war. This is the Chinese way. Unfortunately, with some dogs, they only know respect when it is beaten into them. I am certain Indian is a very reasonable country as well and as such the two countries can continue to have a long and respectful relationship. The picture you posted is from British colonial rule caused artificial Bengal famine. It was not the state of most Indian villages. And the second picture you posted is from a slum somewhere in India. It is not a typical village. And the picture ou posted for comparison with China is not a village from China but a metropolitian city from China. Whole of Asia has called out China as a bully, and yet you professing here about 'being reasonable'. Usages by you like "some dogs" also pretty much shows you don't even speak decent. Recently it was Chinese think tank which mentioned about being guarded against India's economic rise which China has to stand and watch. We really don't like this kind of nasty Chit-Chat. NEW DELHI: India is keeping close tabs on the Chinese submarine currently prowling in the Indian Ocean Region (IOR), which is now likely to head for Karachi after being refused permission to dock at Colombo, even as it has dispatched four warships on an overseas deployment to south-east Asia and southern Indian Ocean. The Yuan-class conventional submarine was "picked up" by Indian Navy's Poseidon-8I long-range maritime patrol aircraft as soon as it crossed the Malacca Strait on April 19-20 as part of the 26th anti-piracy taskforce of the People's Liberation Army-Navy (PLAN). PLAN has been regularly sending its nuclear and diesel-electric submarines to the IOR since December 2013 to extend its strategic reach in the region. "The pretext is anti-piracy patrols in the Gulf of Aden. But what role can submarines play against pirates and their dhows?" said a defence ministry source. The Navy has tracked seven Chinese submarines in the IOR till now, with the first being a Shang-class nuclear attack submarine (SSN) from December 2013 to February 2014. "Two Chinese submarines, a nuclear one alternating with a diesel-electric one, are coming for three months each to the IOR every year. They usually come through the Malacca Strait, where they have to surface due to shallow depth, and exit through the Sunda Strait," he added. They have included the Song and Yuan-class conventional submarines and the Shang and Han SSNs, with the PLAN yet to deploy its new Jin-class advanced nuclear submarines to the region so far. India, of course, lags far behind China in the underwater combat arena, with just 13 old diesel-electric and two nuclear submarines. China, in contrast, has well over 50 submarines. China has also systematically forged extensive maritime links with several IOR nations, and is now even establishing its first overseas naval facility at Djibouti. Though China's primary aim may be protection of its trade and energy sea routes, India has reason to be wary of PLAN's expeditionary forays in the region. India, on its part, is slowly but steadily stepping up military ties with Asean countries as well naval deployments to the Far East to strategically counter all this. Stealth frigates INS Sahyadari and INS Shivalik, anti-submarine warfare corvette INS Kamorta and tanker Jyoti, for instance, are part of the ongoing deployment to south-east Asia in pursuance of the "Act East" policy. The induction of eight P-8I aircraft, under a $2.1 billion deal inked with the US in 2009, has also helped the Navy keep an "intelligent hawk-eye" over the IOR region. Another four P-8Is, packed with sensors and weapons for anti-submarine warfare, will join the force from July 2019 onwards at a cost of $1.1 billion. Anti-submarine warfare will also be a major thrust area during the forthcoming Malabar exercise among India, the US and Japan in the Bay of Bengal in July, as was earlier reported by TOI. Wolfpack and Schwifty like this. Beijing: India is using the Dalai Lama as a diplomatic leverage to challenge China's "bottom line", Chinese state media said today, threatening that New Delhi may have "underestimated" Beijing's determination to protect its core interests. The Chinese reaction to the Dalai Lama's visit to Tawang in Arunachal Pradesh came in an article in the state-run Global Times, which is part of the ruling Communist Party publications an is known for striking nationalistic postures. "Unlike his predecessors, India's Prime Minister Narendra Modi seems to have taken a different stance on the Dalai issue, raising public engagements with the monk and challenging Beijing's bottom line," Chinese state media said according to an NDTV report. "Beijing has voiced concerns over the issue, but New Delhi claimed that China shouldn't intervene in its 'internal affairs'," the article said, referring to Indian Minister of State for Home Affairs Kiren Rijiju's comments on Tuesday. "This is absurd," the article said. Rijiju has said India never interfered in Beijing's affairs, has respected the "One China" policy, and thus China should not interfere in India's internal affairs or object to the Dalai Lama's visit. 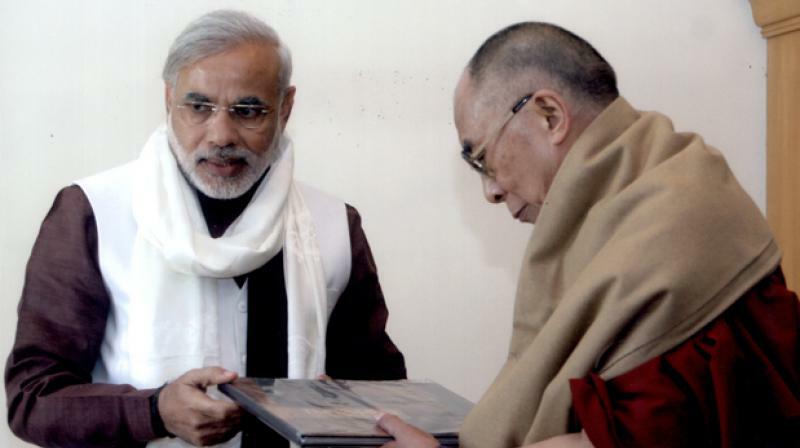 "There is no political angle behind his holiness's visit to Arunachal Pradesh. It is completely religious." Separately, External Affairs Ministry has said that no "artificial controversy" should be created about the visit. The Chinese Foreign Ministry is yet to react to Rijiju's comments or the External Affairs statement yesterday. However, the state media asked India to "overcome its suspicion" of Beijing. "China doesn't allow India to free ride on its economic growth while jeopardising Beijing's core interests." It warned, "New Delhi may have underestimated Beijing's determination to safeguard its core interests. Many countries have pledged not to extend invitations to the Dalai Lama. As the two largest emerging economies, China and India have great potential for cooperation." Today's article also accused India of playing the "Tibet card" as it is dissatisfied with Beijing's stance on India's bid for Nuclear Suppliers Group membership and its attempts to add Masood Azhar, the chief of Pakistan-backed militant group Jaish-e-Mohammed (JeM), to a UN Security Council blacklist. "Therefore, Delhi attempts to play the Tibet card against Beijing," it said, adding that "unlike his predecessors, India's Prime Minister Narendra Modi seems to have taken a different stance on the Dalai issue, raising public engagements with the monk and challenging Beijing's bottom line," it said. India and China have had discussions on the two issues, yet the matters are far from being resolved, leading to strain in ties. Also, China is sensitive to the visit of the Dalai Lama, who it calls an "anti-China separatist", to Arunachal's Tawang region which happens to be the birthplace in 1683 of the sixth Dalai Lama and is at the centre of Tibetan Buddhism. China has in recent days upped its rhetoric on claims to parts of Arunachal Pradesh, which it calls southern Tibet, and even warned India of "serious damage" to ties if New Delhi allowed Tibet's exiled spiritual leader's visit to go ahead. The article added, "India is also exploring the option of linking the strategic border district of Tawang with a railway network, another provocation against Beijing. India has also invited a 'parliamentary delegation from Taiwan in February'." Citing other instances like the Dalai Lama's meeting with President Pranab Mukherjee in December, which Beijing sees as a "provocation", it quoted Rijiju as having said to an international news agency in an interview that "it's a behavioural change you are seeing. India is more assertive." It said that the Dalai Lama is "now openly used by India as a diplomatic tool to win more leverage." Last night, another piece on the newspaper's website said India was using the Dalai Lama's visit to Tawang "to upset" China. An unnamed Chinese analyst told the newspaper that the 14th Dalai Lama's visit to Tawang will hurt Sino-Indian ties. "The Dalai's visit to the controversial area, especially Tawang, which China hopes will be returned, will affect relations between China and India," the analyst from the Institute of Asia-Pacific Studies of the Chinese Academy of Social Sciences told the paper on the condition of anonymity. The analyst too pointed out the religious significance of the Tawang to Tibetans, saying it's the birthplace of the sixth Dalai Lama Tsangyang Gyatso. The analyst said this was not the first time India has used the Dalai Lama to express its displeasure to China, especially when bilateral talks fail to include their demands or to "pander to domestic anti-China issues". Nilgiri, Lion of Rajputana, Hellfire and 1 other person like this. So what do you want, keep sitting eyes closed, why such a huge land was claimed by PRC, a land where studies suggesting of large uranium source were emerging, or the land, from where large rivers like Brahmaputra, Ganga emerges. Or keep buying your Chinese made maps with Kashmir and Arunachal Pradesh not in India from Calcutta Market. I won't be shocked, if the Chinese would claim the South America and Mexico, because they think that the native Americans resembles something like their Mongoloid races. And what China, this just the claim of the PRC People Republic of China Party, and I want to see for how long your protecting force aka PLA keeps you alive from the people of China. The People's Republic of China (PRC) claims that Tibet is an integral part of China. The Tibetan Government-in-Exile maintains that Tibet is an independent state under unlawful occupation. If Tibet is under unlawful Chinese occupation, Beijing's large-scale transfer of Chinese settlers into Tibet is a serious violation of the fourth Geneva Convention of 1949, which prohibits the transfer of civilian population into occupied territory. If Tibet is under unlawful Chinese occupation, China's illegal presence in the country is a legitimate object of international concern. If, on the other hand, Tibet is an integral part of China, then these questions fall, as China claims, within its own domestic jurisdiction. The issue of human rights, including the right of self-determination and the right of the Tibetan people to maintain their own identity and autonomy are, of course, legitimate objects of international concern regardless of Tibet's legal status. China makes no claim to sovereign rights over Tibet as a result of its military subjugation and occupation of Tibet following the country's invasion in 1949-1950. Instead, it bases its claim to Tibet solely on its theory that Tibet has been an integral part of China for many centuries. China's claim to sovereignty over Tibet is based almost exclusively on self-serving Chinese official histories. Chinese sources portrayed most countries with whom the emperor of China had relations, not only Tibet, as vassals of the emperor. When studying Tibet's history, Tibetan sources should be given primary importance; foreign sources, including Chinese ones, should only be given secondary weight. BEIJING: China on Monday asked India to be "cautious" and exercise "restraint" over building infrastructure in Arunachal Pradesh, days after Prime Narendra Modi launched the country's longest bridge linking Assam with the state claimed by Beijing. China's position on the eastern section of the Sino-Indian border areas is consistent and clear," a statement in Chinese said. PM Modi last week opened theBhupen Hazarika who hailed from Sadiya, the PM said it will serve as the foundation for a new economic revolution and help India in its efforts to become a superpower. "The reduction of distance by 165 km and cutting travel time by seven to eight hours will open new doors for economic development... The bridge will bring development to Assam and Arunachal Pradesh. Hellfire and Lion of Rajputana like this. India should adopt the policy - "Enough of it, ignore the barking dogs"